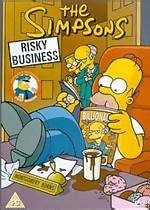 The Simpsons Risky business is a collection of Simpsons episodes that features the theme of "business" and of course, televisions most beloved family. The DVD features four classic Simpsons episodes that tell the tale of the diverse jobs that Homer and Marge Simpsons have engaged in. The first episode in the collection is entitled "Reality Bites" and features Marge as a real estate agent. Unfortunately for Marge, she cannot quite manage to lie and apart from being an abysmal real estate woman, she manages to sell one of the creepiest homes in Springfield to the Flanders that contains some "bloody" secrets. The second episode is entitled "Homer the Smithers" and features Homer as Mr. Burns personal assistant when Wayland Smithers suffers burnout. Homer engages in a variety of anecdotes that include imitating Mr. Burns mother and almost killing him at the same time. The third episode is entitled "Deep Space Homer" and after NASA suffers considerable bad ratings, they decide to train an average American as an astronaut. Fortunately for Homer, not only does he save the day but also manages to fill his stomach with a bag of potato crisps in space at the same time. The last instalment of the collection is entitled "Marge gets a job" and after studying their finances, Marge decides that the Simpsons family needs an additional income and applies for a job at the power plant. Unfortunately for Marge, Mr. Burns soon falls for her and decides to take things that one step further. The video quality of the disc was a mixed bag, considering that many of the episodes are from the early seasons of the Simpsons but it still contained some extremely sharp colours and clear picture quality. The audio quality of the disc, although only Dolby Digital 2.1 still sounded quite clear and audible through my Philips home entertainment system. The Simpsons Risky business, features four classic episodes that tells the extremely funny anecdotes of the Simpsons family. Although not an entire season of Simpsons, it will help Simpsons fans get through the drought until the next season is finally released. Unfortunately the disc didn't contain any extras whatsoever and I don't call the bonus "Chief Wiggum's finest moments" as an extra because it seems to have been included at the last minute and is only a string of video clips that have been put together. With adult orientated humour mixed with slapstick, the Simpsons Risky Business is the perfect light-hearted addition to your DVD Collection.